Description of "A Window to Young Minds"
Our future depends on stories. As the world advances, literature has the ability to ground us—in our humanness, our imaginations, and our enlightenment. Fueled by the need to interpret the past, to explore the present, and to imagine the future, each generation shapes the world of books. In order to preserve this, we must have a new generation willing to share their stories. The annual Lune Spark Short Story Contest was started in May 2017 with the vision of supporting young writers. 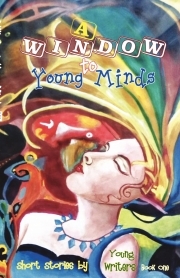 A Window to Young Minds is the first of the contest’s yearly anthologies, Short Stories by Young Writers. The twenty-three wonderful stories in this book are handpicked from 2017’s entries. The talent of these young writers shines in their command of storytelling and their unique take on genre—from a pirate love story to the Hindenburg disaster on May 6, 1937, in New Jersey. Lune Spark’s mission has been to find talented writers and make their unique stories available to the world. We publish children’s fiction, mainstream fiction, short story books, and children’s picture books. We always love to hear from our readers and book lovers through their book reviews and direct emails. For more details, please visit our website. Reviews of "A Window to Young Minds"